Liam and Dylan's Room: Two brothers and a dog. These two brothers share a very small room that we equipped two beds, shelves, a desk, a dresser and, of course, upper bunk bed access for the family dog. This required that we install paw-friendly stairs, rather than a space-saving ladder. The upper bunk features a headboard that serves as both a storage unit and nightstand, and the lower bunk bed is free-standing so that it can be utilized as a separate twin bed should the family’s needs change in the future. We included more storage space beneath the lower bunk, as well as a free-standing dresser that sits on wheels to allow for access to the HVAC unit that sits behind it. 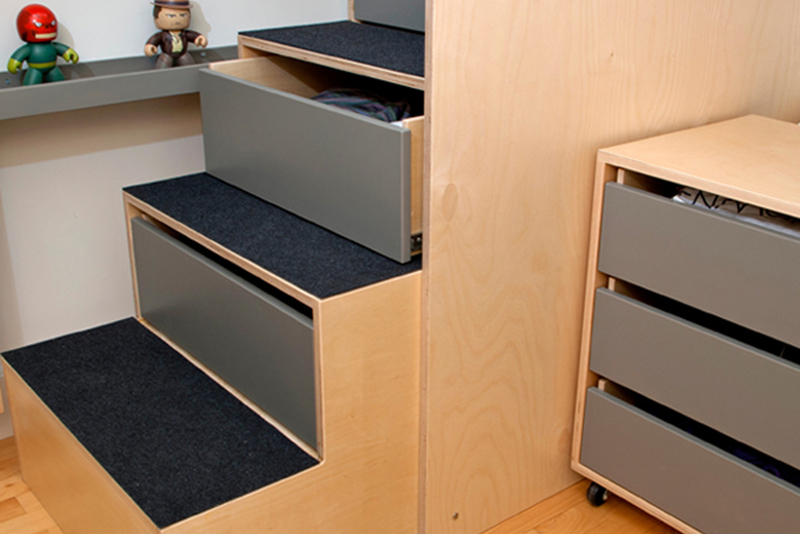 We maximized space by using dual-functioning stairs that also serve as drawers, as well as a folding desk.